Applying a protective coating such as paint to aluminum can help keep the metal from corroding. 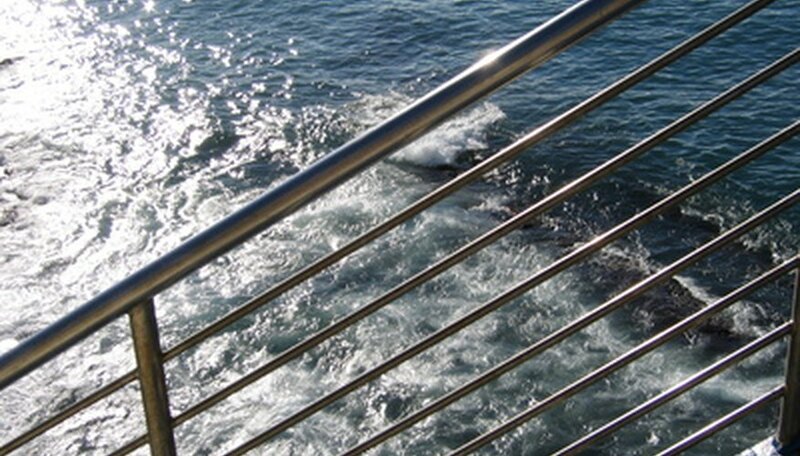 Outdoor aluminum railings in particular need protection, due to constant exposure to rain, snow and sweaty and dirty hands. A layer of paint can also give an aluminum railing a splash of color that matches a building's architecture or decor. Painting an aluminum rail is a straightforward task, as long as you take the proper steps. Cover your work area with a waterproof protective drop cloth. This will stop any dirt or paint getting on the area around the railing. Clean the railing using the wire wool. This will remove any dirt, grease or rust, which will stop the paint from binding to the metal. Apply a layer of primer to the railings using a paint brush. This is essential in achieving a good finish with the paint and ensuring the paints longevity. Leave the primer to dry for at least 24 hours. Paint the railing using paint brushes. Any metal paint will be suitable for this task, but if the railing is outside an all-weather paint must be used. Allow the paint to dry for at least 24 hours. If needed, apply a second coat. From time to time the railing will need to be repainted. This will need to be done when the paint starts to peel or rust starts to show on the surface. Chris Rowling has been a professional writer since 2003. He has written news and features for publications covering insurance, pensions and financial markets as well as articles for local newspapers such as the "Richmond and Twickenham Times" and the "Hounslow Chronicle." Rowling graduated in 2002 from St. Mary University, London, and took a postgraduate degree in journalism.